The Smark Henry RAW Review (4/8/19): RAW is Caw-caw! - Smark Henry | The voice of Filipino wrestling fans | Philippine Wrestling Revolution, WWE, and more The Smark Henry RAW Review (4/8/19): RAW is Caw-caw! The Smark Henry RAW Review (4/8/19): RAW is Caw-caw! I think we're all in agreement with the idea that the RAW after WrestleMania is always the most exciting RAW of the year. Aside from establishing the aftermath of the events that transpired at the Grandest Stage of Them All, the RAW after WrestleMania also gives us glimpses into the possible futures of current storylines as well as shaping new and upcoming feuds. That and "surprise" debuts, mostly from NXT. That's undisputed, right? Apparently, we're all wrong because for some reason, this post-WrestleMania RAW was basically disappointing, if not a Women's Right to the gut. At least, we had The Undertaker return, though, and Lacey Evans finally did something else outside of wasting everyone's time. Oh, and Sami Zayn is now bald. That's a good thing...I think. Caw caw! I'll be honest with you, I missed the gravity of Elias' "dead man" line until The Undertaker's gong rang. With those AEW rumors and stuff, as well as WrestleMania coming and going without even his shadow, The Undertaker was as good as gone for me. So when he actually appeared, I popped immensely. Man, this was a really fun surprise. Seeing The Undertaker make his entrance, chokeslam Elias before making him "rest in peace" with the good ol' Tombstone Pilerdriver was a definite treat. Unfortunately, this was a bit odd. Like I said, WrestleMania had already come and gone, and The Undertaker was just making his appearance here? 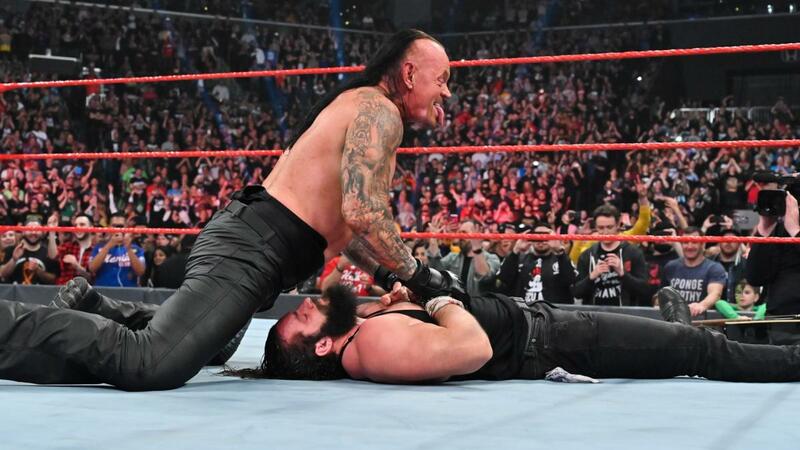 Usually, The Deadman would have some sort of segment at the Grandest Stage of Them All, a match even, but he was nowhere to be found during that seven-hour long program. I'm not even entirely sure what'll happen to him now, why he's here, because The Undertaker's greatest draw is linked to WrestleMania and vice versa. He's like the most anticipated character of a tv show, not the overexposed protagonist but the featuring player, and WrestleMania is the season finale. Watching this appearance just made me a bit sad, as I ended up thinking of how young I was when I first saw The Undertaker. With his WrestleMania streak gone, with his WrestleMania hook gone, The Undertaker seems like he's way past his mystique now, going the way of Ric Flair and Hulk Hogan. Maybe it's time he retires. Hopefully, he'll have a better retirement run than Kurt Angle. To have either Charlotte Flair or Ronda Rousey retain their respective titles would've been a boring WrestleMania moment, so Becky Lynch winning both women's titles was the most logical choice. There was one caveat, though, and it was the apparent botch of the finish, which saw Ronda's shoulders up for the pin. Surely, they'd have a logical way to address that, right? Nope. They just ignored it this week, which I thought was sad, but then again, Ronda could use it upon her return to demand a rematch and reignite their feud. Hopefully, with more police cars. It's just the first RAW after WrestleMania, so they pretty much still have plenty of time to address that. Not that there's a deadline, though, because apparently, Charlotte and Ronda are now out of the title picture—at least for the time being—as a new challenger has entered the fray. Well, she strutted her way into the fray? Was that even a strut? I can't tell anymore. Every time Lacey Evans' theme plays, I just end up rolling my eyes during her entire appear-and-disappear schtick. This time, though, it was different. This time, though, Lacey did more than just walk out to the ramp, wave, and walk back to the locker room: She punched Becky right in the face. That was pretty surprising, and the brawl that ensued captivated me from start to finish. Lacey Evans was actually in the military, and NXT did a great thing of mentioning this every freaking time they could because her gimmick wouldn't make you think she'd be that freaking dangerous. Hopefully, WWE would try and emulate this, build Lacey up as an actual threat to Becky's reign, because as it stands, a nuisance in a hat and dress that punches people in the face is a pretty obvious step down from tussling with a legend's legacy and a former MMA fighter. Speaking of getting punched in the face, the main event really hurt, didn't it? Seth Rollins might not have been my first choice to dethrone former Universal Champion Brock Lesnar but he does look good with that title around his waist. Seth responding to all the "you deserve it" chants with "no, WE deserve this" was brilliant. It was a great testament to how wonderful of a face he can really be, which is actually the exact opposite of how he won the title in the first place—hitting the former champ in the balls like a textbook heel. Kofi Kingston coming out with the New Day to celebrate his victory as the new WWE Champion was a welcomed surprise. This might have slightly hurt the whole brand split idea, but Kofi did have a great point about not being able to wait for SmackDown to celebrate: he's waited 11 years to get another main event title shot, and this success warrants him usurping Seth's own championship celebration. 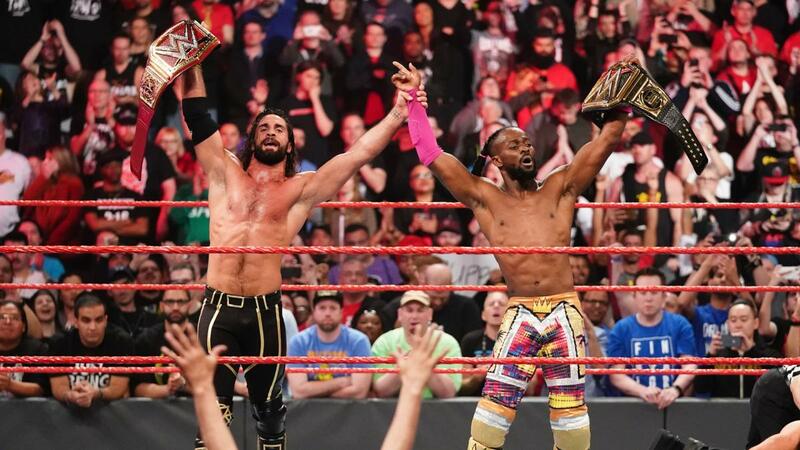 Honestly, I was a bit concerned with the whole Winner Takes All stipulation, mostly for Kofi, because I didn't want either of these guys to lose their titles this early. 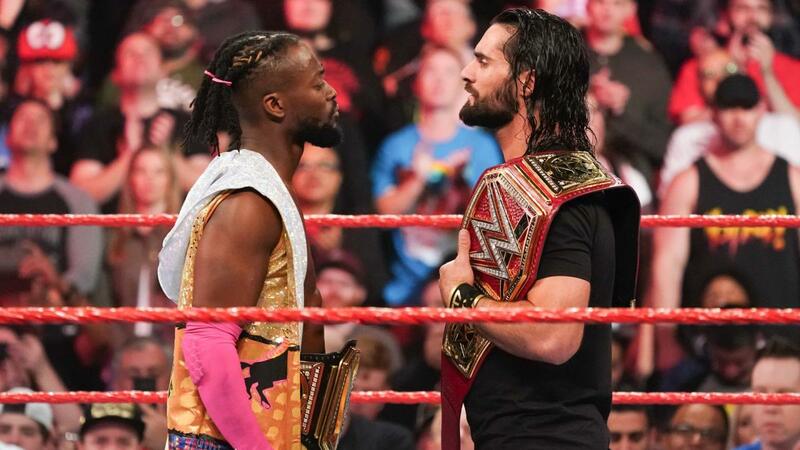 Let's face it, between Kofi who's had to wait 11 years to get that main event title shot and Seth who's pretty much at the top of the Monday Night RAW food chain, Kofi was the one most likely to get the short end of the stick here. I appreciated the fact that they chose to protect both men's title reigns, but The Bar causing the disqualification to do that and then ending up main-eventing against the makeshift tag team of Kofi and Seth? That's just wack. The drama, the intrigue, the potential for great storytelling not to mention for a great and undisputed debut was right there, but we ended up getting the most disappointing of all choices. The Bar is a great tag team and all, but they did not need this spot and this didn't really make sense for them. RAW REVIEW: Both belts were on the line, and both champions just started their respective reigns. Having neither of them win was the best choice but the main event could've been better. Way better. We have double disqualifications for a reason, and this being the RAW after WrestleMania, we could've had someone—or some ones—do just that: cause the double disqualification and make an undisputed statement in their great debut. The Undertaker's return, Sami Zayn's return, Lars Sullivan's debut, and Dean Ambrose's final final match were all fun stuff, but the main event really under-delivered for me, and I just can't stop shaking my head at it. I'm giving this week's RAW a D for "Damn it, WWE." Wait, I thought automatic title rematches were a thing of the past? So how did The Revival get this WrestleMania rematch for the RAW Tag Team titles against Curt Hawkins and Zack Ryder? Oh, because of all the AEW rumors? Wack. A part of me wasn't surprised that Kurt Angle made an appearance on this week's RAW because a part of me is still in denial that his WrestleMania retirement match happened. Kurt deserved better than that match and to be honest, he deserved better than this entire run. While it was satisfying to see him lock the Angle Lock on Baron Corbin, that still doesn't change the fact that Corbin retired him. Kurt's segment with Lars Sullivan just made me think of how effective it would've been if Kurt made Corbin tap at WrestleMania, since his career wasn't even on the line, only for Lars to come out then and destroy him. Have his last match be a victory via submission? Check. Have him put over new talent on his way out? Check. Two birds with one stone. Alexa Bliss wrestling again is a better option than her A Moment of Bliss segments. Little Miss Bliss is a great promo but the talk show format does not do her justice. It's a little sad that her victorious return came at the expense of former WWE Women's Tag Team Champion Bayley but you can't win them all. Not even by trying to cheat while you're a babyface. Weird. That up-close and personal staredown between Chad Gable and Aleister Black during their tag team match was pretty awesome. Bobby Roode attacking Ricochet after Glorious Gable's loss was also pretty awesome because finally we'll be getting Roode at his best, and his best is usually with him wearing a tuxedo and reminding me that I'm not as attractive as him. Control your son, Triple H! Bray Wyatt is now a bird puppet. Wack. I enjoyed Bobby Lashley's line about taking care of Renee Young, Dean's wife, in his stead when he "leaves" RAW. I thought that was amazing heel work because even though it's basically a cliche, everyone outside of the announce team seems to not know that Dean's married to Renee. I mean, you had that sort-of feud with Dean, Drew McIntyre! You're a psychopath, so why didn't you try and threaten Renee's face? Dean going nuts because of the comment was also amazing and so was the crowd thanking him after Lashley put him through a table. Nice. Mojo Rawley broke his mirror and is now wearing some sort of weird blue make-up around his left eye, so that happened. Sami Zayn returned, bald, to lose to Intercontinental Champion Finn Bálor... Wait, this was Finn the Human! The Demon won the title, not Finn the Human! This does not make sense! You know what else did not make sense? Sami coming out as a babyface, only to turn heel with that promo in one match. The Big Show is not amused. I was, though, because this match was great and Sami's promo was also great. Despite having been humiliated by Ronda Rousey when we last saw her, Dana Brooke is still positive about becoming women's champion one day. Or something along those lines. Jofer Serapio (@ShawarmaJoe) reviews WWE RAW & NXT UK for Smark Henry. 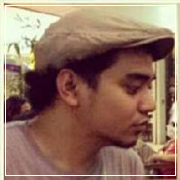 He has been an avid professional wrestling fan since grade school. These reviews are as close to professional wrestling as he can get. Aleister Black should retire The Undertaker in next year's WrestleMania.